Geo Holistic offer a variety of products at competitive prices for commercial and industrial customers. We provide our customers with reliable after sales services including installation, process training and commissioning. We offer a full design and build package to suit your individual coldroom requirements. Our custom coldrooms are manufactured to your exact specification. We support temperature range from -40 C to +60 C.
Geo Holistic offer a range of walk in modular Freezers and Chillers. Easy to assemble on site our modular rooms offer a cost effective solution to your temperature controlled requirements. We have a wide range of refrigeration compressors for trucks, vans, buses, boats and commercial applications. We can also source all leading brands due to our extensive contacts within the industry. Our range includes hermetically sealed compressors, semi hermetic compressors and open compressors. APFC Panels offered by Geo Holistic are manufactured using quality tested range of materials and components. These APFC Panels help monitor the reactive power which helps in saving energy. We offer our esteemed customers a range of optimum quality Power Control Panels which provide premium results and advanced technology. We design and supply Electrical Control Desks as per customers requirements. These Electrical Control Desks are simple in design and are used for control, fault annunciation, instrumentation and more. We offer a wide range of custom PLC Panels. These are designed and developed as per the specific process application requirements. Our PLC Panels are manufactured in line with industry standards to ensure quality and durability. 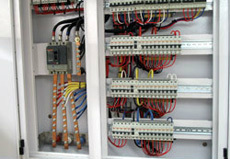 We successfully meet the manufacturing demands of Electrical Distribution Boards that are widely used in the commercial and industrial industries. We use high quality materials in the production in order to offer our customers optimum functionality. If you do not see what you are looking for, please Contact Us and we will be happy to help you find what you need.